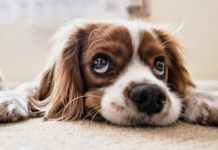 What to look for when buying cheap dog food? One of the most important things to consider when getting a dog is buying nutritious dog food. The thing is, even for humans, regular groceries can become expensive. Adding a dog (or dogs!) to the equation can significantly bump up your monthly expenses. Right now, you might be steering clear of cheap dog food on the market. You might be thinking that it’s just a ‘filler’ food with little to no vitamins to keep your dog satisfied. Over the decades, however, the cheap dog food brands have increased the quality of their dog food for the money. 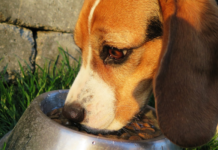 What you feed your dog can greatly affect their well-being and their behavior. That’s why we find it vital that every pet owner gets the best rounded opinion on the products they buy. Here, we will provide a well-rounded series of reviews on the best, cheapest dog food products/brands. We decided to research the very best, cheapest dog brands on the market. After spending hours reviewing customer opinions, we think we managed to come up with a reliable list that you can reference. 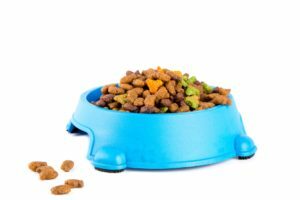 Below, we have provided a list of the cheapest, best, most nutritious and vitamin-full cheap dog food products that we could find. There’s no doubt that all the cheap dog food brands listed below have a good reputation. They are meant help keep your dog healthy and energetic with their nutritious value. Taste of the Wild is a company that thinks every pet should have a good, full dog bowl of nutritious food every day. They are well aware the cheaper dog food brands usually tend to do good things to the budget of the owner. However, most of the time, they are not exactly the best tasting or have the most vitamins. The company goal was to create a series of products that will both taste good, and be affordable to buy long-term. The Taste of the Wild dry dog food packages have been best-seller hits, and the pups seem to love them, too. The full bowls disappear within minutes and leave the dog full, satisfied, and have enjoyed the taste. Every ingredient that is put into this pack of Taste of the Wild dry dog food has been carefully selected to benefit your dog one way or another. providing a rich, nutritious diet. All of their products are also tested by safety departments to make sure the customers only got the best. All of this happens within the sterile, facility environment of the Taste of the Wild headquarters, which oversees every process with caution and care. Taste of the Wild dry dog food comes in a stylish package that depicts well-illustrated interpretations of a wild pack of wolves. Staying true to its name, Taste of the Wild is ready to provide your dog with various sized packages of food. Ranging from 5lb packs, to 14lb, 15,lb, 28lb, and 30lb. 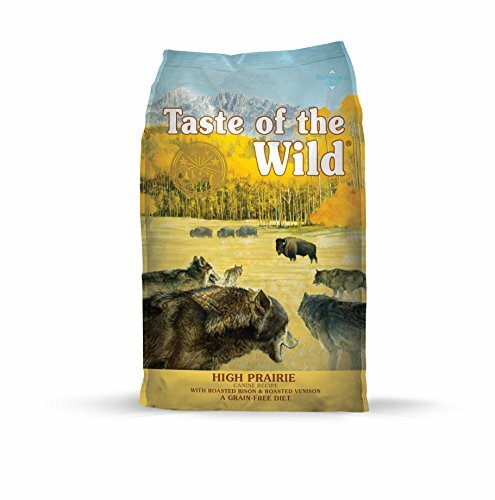 Taste of the Wild dry food for adult and young dogs have various flavors: roasted bison, legumes, lamb, wild boar, roasted duck, and salmon. No matter how fussy your dog/s are with their food, with all these options, they will surely find something they enjoy. It’s also great to alternate between the packs since they all have slightly differing dog food ingredients. With a blend of minerals, vitamins, fruits, and vegetables, this dry food for adults dogs and pups has everything your dog needs to keep them energized throughout the day. From natural antioxidants to fatty acid blends that help improve your dog’s skin and coat. There is no grain, wheat, corn or any other fillers within this pack of dog food. The Taste of the Wild package is also known to include a lot of optimal amino acids and protein-rich ingredients. These compounds help your dog keep and develop their lean, strong muscles. Being made in the USA, you won’t have to worry about the food being imported from other markets. You can rest assured that you will be getting 100% fresh dog food that is made/collected on demand every day. Also, the food is made under the strict, USA guidelines and safety protocols. Nature’s Valley high-quality dog food is definitely a product to keep an eye on. That is, if you want your dog to grow up healthy, wagging their tail every day. Nature’s Valley main goal is to provide pet owners with a reliable product that only consists of natural ingredients. They aim to keep the end results as organic as possible. One thing worth mentioning is that Nature Valley is one of the top leading dog food brands in the dog food industry. Ranking in right after other popular dog food brands, such as Instinct and Prairie, you can rest assured that you will be providing your dog with quality food. They were founded in Nebraska and since then, their only motto has been to help dogs and owners get affordable dog food, with a lot of nutritious value. Their food packages are a wonderful mix of reliable dog food ingredients, good prices, and good amounts for the value. If you want to feed your dog a regular batch of good, raw, natural food, then getting your supplies from Nature’s Valley’s products will allow you to do just that. Many customers have reported that they noticed a positive change in their dog’s energy levels within weeks of giving them the affordable grain-free dog food! Nature’s Variety Instinct Original affordable grain-free dog food comes in two bags, one 4lb pack and one 20lb pack. The 20lb is definitely a fantastic value for the money, and will definitely save you a few pennies along the way. The illustration on the front is simple yet inviting, showing a few of the ingredients included within the package. The main flavor of the Instinct Original affordable grain-free dog food is wild-caught salmon. Salmon is known to have a lot of protein, and that’s another reason as to why many customers flock to buy this pack in general. Protein helps your dog keep their strong, lean muscles and encourage their growth. Nutrition The Instinct Original has a ratio of having 72% real animal ingredients (such as the salmon, and other oils), and 28% fruits, veggies and other vitamin-filled ingredients. One thing is sure, there is 0% grain, and no fillers. If you’re looking for a meat-free alternative, try these vegan dog treats. Nature’s Variety made sure to not include any corn, wheat, soy, potato or grain products within this package. There are also no artificial colors or preservatives provided within the package. This ensures that your dog will get only the best nutritious value from real, quality ingredients. 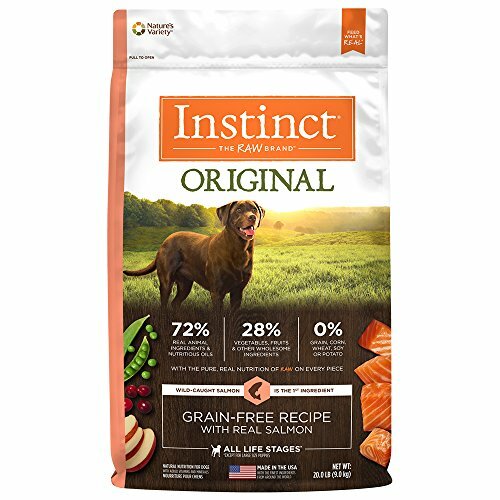 The Instinct Original is a package full of vitamin-rich affordable dog food that has been made in the USA from the best, most fresh ingredients around. From the get-go we can see that Nature’s Recipe’s high-quality dog food package bundle looks inviting. Right away it sends out positive vibes from the way it’s packaged. With over 800 reviews under its belt, it’s also an Amazon’s Choice product. If you have been looking for a product that has been tried and tested by many over the years, then we can safely say that this product should be your final call. Nature’s Recipe’s goal has been to make fresh and raw food for dogs. They also want to provide them with healthy kibbles that have something beneficial within every bite. Nature’s Recipe has been on the market for over 35 years now. Since then, they have been growing, expanding and developing. Experts and nutrition specialists have made sure that only the best ingredients make their way into this batch of dog food. If you decide to settle for Nature’s Variety’s dog food, you can rest assured that your dog will thrive on these kibbles. 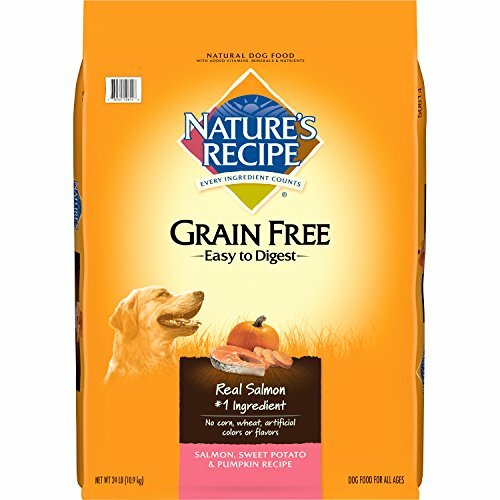 The bright, shining colors of the packaging of Nature’s Recipe Grain Free dog food pack should invite just about anyone to take a look and read the specifics that they offer. The bag is available in 4 different sizes: 4 pound, 12 pound, 14 pound and 24 pound. Nature’s Variety made their affordable dog food pack contain real salmon. This is important, since Salmon is the #1 ingredient that heps dogs retain sufficient protein levels. It also helps give them enough energy to run around. This, in particular, helps the pups maintain healthy and lean muscles. Nature’s Variety is known for not including any sort of grain or wheat in their products. The words ‘grain-free’ are written in big, yellow letters on each of their products. This means that your dog will get their full nutrition value from the salmon base. As well as other, vitamin-filled products provided within the pack. This package actually uses some special ingredients that not many other cheap dog food brands use. Those ingredients are sweet potatoes and pumpkins. They are a wonderful carbohydrate-alternative to grains. They also provide your dog with lots of energy in the healthiest way possible..
Having no artificial colors or flavors, this product is 100% safe to give to your pup. It’s formulated for all breeds (click here for pitbull dog food) and all lifestages. It can be given to puppies, teenage dogs, adults dogs and senior dogs alike. Senior dogs will benefit from high quality dog foods such as this Orijen senior food for dogs. 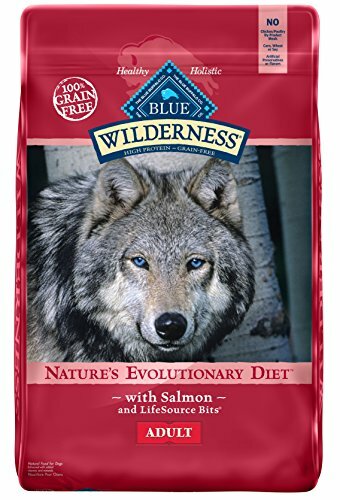 Blue Wilderness is the best budget dog food brand for sensitive-eaters. They provide our dogs with the ideal solution of good-tasting food, good-pricing, and reliable services. With nearly 3,000 reviews from reliable, happy customers, this is definitely the most popular brand on our list so far. BLUE has been named after the owner’s dog, Blue. Blue had severe issues with cancer, prompting the owner to delve deep into pet nutrition and health issues that dogs face worldwide. The solution they came up with? The company, BLUE, which provides quality, healthy, nutritious, premium food. Food that will help your dog stay healthy and thriving for as long as possible. All of their dog food packages have a base of either real chicken, lamb or fish. This gives the dog with a good, solid, filling food base that is enhanced with oils and vitamins that keep their energy levels high. BLUE has worked with leading nutrition experts and veterinarians when developing their recipe. This was to make sure that their food recipes are up to par with dogs. They have also passed rigorous health and safety tests countless times. The deep, rich colors of each package of the BLUE dog food packs will invite just about anyone to come and take a look. The enticing wolf illustration also helps. You can purchase the pack in various sizes: 4.5lb, 11lb and 24lb. The BLUE packages come in various flavors, ranging from salmon, to chicken, duck and healthy weight chicken. No matter how much of a picky eater your pup is, they will certainly enjoy at least one of these variety packs. You can also try these dog food options for fussy dogs. BLUE is known for having the best inexpensive dog food that is very high in protein and grain free. This means that your dog will get all the beneficial protein that they need to have healthy, strong muscle groups. The package is packed with wholesome fruits and veggies. They will help provide your dog with all the vitamins and minerals that they need to stay healthy. Each BLUE pack contains real meat or real fish, depending on which package option you end up choosing. There are no chicken by-products included within the BLUE dog food packs. No by-product chicken meals, no soy and no wheat. Next on our list we have another product from BLUE. owever, this time, with a slightly different recipe and packaging. As we mentioned before, BLUE’s main goal is to make food for sensitive pups. This means that the package is free of ingredients that could upset your pup’s stomach. It’s the best inexpensive dog food packet to give to any dog that you want to be healthy. Reaching nearly 5,000 reviews, it’s easy to see that thisproduct is a best-seller. It’s very popular product among many dog owners thanks to its affordability. 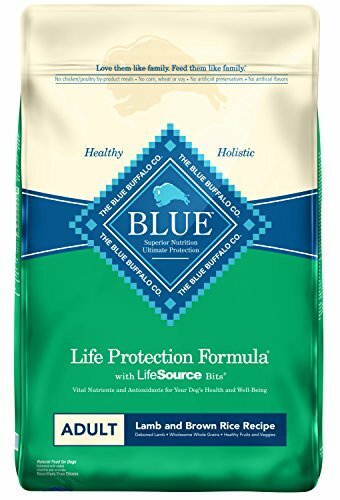 The main difference between this BLUE dog food packet and the one reviewed above is the Life Protection Formula used here. If you want to keep your pup satisfied and full at an affordable price, then we can wholeheartedly recommend taking a look at the BLUE Life Protection Formula package. It looks great, and dogs seem to love it, plus it’s nutritious. The simplistic, geometric design of the package allows the customer to quickly sink in the true focus of BLUE’s goal here, the Life Protection Formula. The package comes in various bundles: 4lb, 6lb, 15lb, 30lb and a variety bundle, which includes various flavors provided by BLUE. Just like with the previous package, BLUE provides a series of flavors. Mainly: chicken, fish and lamb, all of which are mixed together with a healthy brown-rice recipe. There are also varieties of the meats. Such as small breed chickens, small breed lambs, healthy weight chickens etc. The BLUE package is meant to be protein-rich and is filled with healthy meats or fish bases. They are all deboned to help your dog eat their meal in peace. Dog owners who have purchased this pack always report that their dogs end up clawing for more. Which undoubtedly means that the taste must also be satisfying! No preservatives or artificial colors and included within the BLUE packages. This means that they will need to be consumed quickly and regularly. This however is wonderful, since it means that all the products within are fresh and first-grade. IAMS has been a reputable brand for many years now. With nearly 1,000 reviews from happy customers behind them, it’s easy to see that the dog owners purchasing it are satisfied. IAMS knows that the only way to supply dogs with good, quality, affordable dog food is to know them better than anyone else. After years of research and help from veterinarians as well as professional pet food specialists, they have reached a conclusion. Our pets need a unique, fully-rounded supply of nutrients, minerals and fatty acids to stay healthy for as long as possible. With this philosophy, IAMS moved forward and create the Proactive Health packages. The company had its start in 1946, when Paul IAMS wanted to help to extend the lives of our pets. He soon realized that the food we give to our pets is a vital factor, that concerns how long and how they live. After deciding that pets are predominately carnivores, Iams revolutionized the pet food industry at the time, and began to develop IAMS. 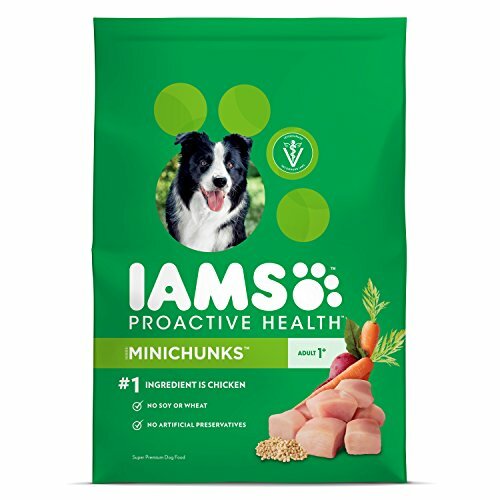 The IAMS packages come in their distinct, light, energetic green color. They are available in various sizes that should fit just about any household, no matter how many pups they host. The packets come in the following sizes: 3.3lbs, 7lbs, 15lbs, 30lbs and 38.5lbs. The IAMS Proactive Health dog food pack comes with a carnivore base: chicken. IAMS is known to use only quality, farm-raised chickens in their recipes. The protein they receive from the meat will help them keep a strong, lean build that will allow them to face each day with energy. The IAMS recipe has proven to help dogs maintain healthy digestion thanks to all of the fiber and prebiotics blends included within the mix. Also, thanks to the antioxidants, the food helps the dogs maintain a strong immune system. This means fewer trips to the vet! Thanks to the recipe that IAMS has developed, all of the ingredients included here have been specifically picked and sorted out to make the best, nutritious, cheap dog food on the market. The package is filled with 100% real chicken, prebiotics, fiber, antioxidants and L-Carnitine, that helps maintain healthy metabolism. Thanks to IAMS reaching out to vets, professionals and other specialists, their Proactive Health Minichunks have passed all the USA pet food safety tests and continue to do so, as they serve more and more dog owners each day. Pedigree is one of the most popular, best cheap dog food brands. They believe that dogs make the world a better place. They believe that we get to bring out the good in them with the food we feed them each day. This means that our pets need to be supplied with quality food, and that’s exactly what Pedigree provides. They have dry and wet dog food, and the Pedigree Complete Nutrition package will help your dog get all the vitamins and nutrients that they need to get through the day with energy and vigor. The Pedigree packaging has simple, tropical colors and has a simple, fuss-free design that allows you to quickly learn what the package contains. You can get the Complete Nutrition pack in the following sizes: 15lbs, 20.4lbs, 33lbs and 40lbs. You can get the Pedigree Complete Nutrition pack in two flavors: chicken and steak. This particular pack has a Roasted Chicken Rice & Vegetable flavor, which many dogs seem to love. Many dog owners report that their dogs wait with anticipation for every bowl. The Pedigree recipe is one of the most nutritious packs on our list so far. It has a variety of complete and balanced nutritious fatty acids. 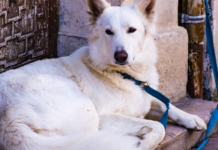 Acids such as the Omega-6, which helps keep your dog’s coat healthy and glowing. There are also several vitamin compounds included within the recipe, such as vitamin B, vitamin E and zinc. The Pedigree pack contains all the necessary vitamins (E and B) to help give your dog a strong immune system, healthy metabolism and healthy digestion. This is all thanks to the blends of fiber and antioxidants provided within the kibbles. The kibbles themselves are also crunchy, to help keep your dog’s jaws, gums and teeth healthy and working. All of the Pedigree dog food packages are made in the USA with the finest, highest-quality ingredients. It doesn’t include any fructose syrup, unnatural sugars or artificial flavors/colors. Hill’s mission on the dog food market is to help enrich and lengthen the lives of our faithful pups. They know that dogs trust their owners, and their owners trust them to provide their dogs with good, nutritious food. Their philosophy is to help take care of our pets, even if it’s indirectly. This means helping them achieve a long, energetic, fulfilling life that can be a catalyst to many adventures. Having been founded in the late 1930s, Hill’s was inspired by a guide dog. Originally, a blind man named Morris Frank was supposed to be touring the country with his pup, Buddy, promoting guide dogs. On his trip, however, Buddy was suffering from kidney failure. That’s when Morris Frank decided to turn to his father, asking for guidance and help. It was believed that the cause of Buddy’s illness was poor nutrition. That’s when Morris decided to develop a new pet food recipe at his kitchen home. The rest is history! Hill’s packaging is simple and down-to-the-point. All the nutrients, vitamins, minerals and ingredient are listed at the front right along with any other ingredients. The bag comes in various sizes, some of which are: 15.5lb, 17.5lb, 30lb, 33lb and 35lb bags. The Hill’s Science Diet pack comes in two flavors: lamb and chicken. There are packs available both specifically for pups, and specifically for adults. The chicken used within these kibbles is of high-nutritious value and help deliver quality protein to help build lean muscle. All of the ingredients within the Hill’s Science pack help encourage healthy metabolism and a healthy weight. All of the foods included within the kibbles come from natural sources. Glucosamine and chondroitin, that are also included compounds within the food, support joint health as well as a healthy immune system. Hill’s dry dog food pack is full of omega-6 fatty acids, a blend of vitamins (predominantly C and E) and antioxidants. All of these ingredients help the dog have a healthy lifestyle, healthy organs and a healthy, glowing coat. Hill’s science dry food is ideal for both puppies and adult dogs, and both of the young puppy food and adult dry dog food packs are designed specifically for those dog lifestages. This means that each pack of adult dry dog food is tailor made to suit your dog, no matter what breed they are (see yorkshire terrier dog food here), or how old they are, making it 100% safe. Purina is a company that loves pets, and that’s why they want to make them as happy as possible. In fact, they even have pets sitting at their feet when they work. Their passion for furry animals has lead them to help push pet nutrition forward. They are trying to encourage everyone to take a look as to what they feed their dog. They know that most diseases and problems that dogs face are a result of a poor diet. Whether the owner knows that or not, it’s important to look at what you feed your dog. Purina wants to help educate fellow pet owners, and they do that through promoting their Purina ONE SmartBlend dog food packages. Their packs contain all the necessary nutrients to help give the pup enough energy to last a day. Either way, Purina wants our pets to be able to live through our memories and share them. The only way that’s possible is if they’re healthy. Health depends on what we eat, that’s why they developed a recipe that helps deliver all the necessary nutrients to the pet’s life. Many people shy away from Purina’s product because their packaging looks like it comes from a premium-expensive shelf. That, however, couldn’t be further from the truth. 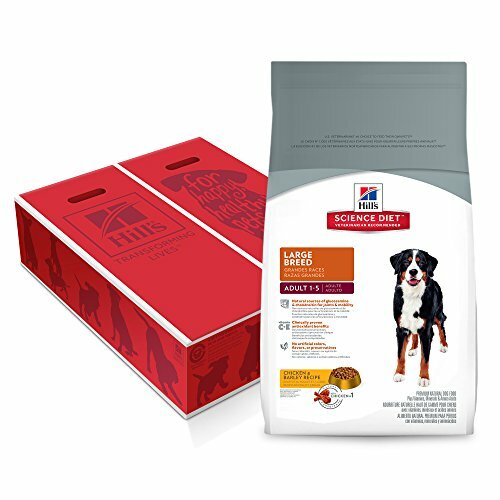 Purina ONE’s dog food pack is more than affordable and many customers have subscribed to use it as their main way of feeding their dog. The pack comes in the following sizes: 4lb, 8lb, 16.5lb, 31.1lb and 40lb. 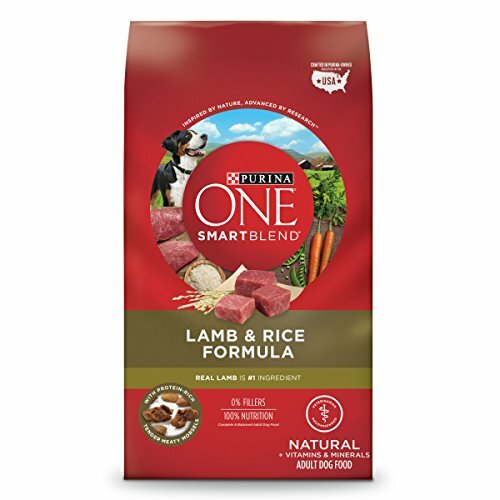 The Purina ONE pack has the taste of lamb, and is designed after the official Purina Lamb & Rice recipe formula. The pack contains plenty of omega-6 fatty acids, vitamins and minerals that will help protect your pet’s immune system. It will also help encourage their metabolism and help provide enough energy for them to remain active throughout the day. The Purina healthy dog food contains a dual-defense antioxidant blend that helps your dog fight any flus, cold or other mild common illnesses. The natural source of glucosamine included within the blend also help the pet maintain healthy joints, which is vital as our pets get older. Purina has been doing business since 1894, and with over a century of experience, there isn’t much that can go wrong anymore! This remains the favorite brand of many pet owners, not only thanks to its affordability, but also thanks to its reliable recipe that never changes. Nutro knows that our pets mean a lot to us, and that we want to keep them around for as long as possible. They also know that the only way we can do that is by providing them with a loving home, regular dog care and, above all, good nutrition. 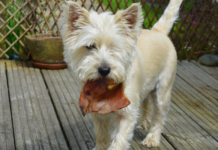 Our dogs aren’t very picky eaters, and that’s why we need to decide what’s best for them. That makes us responsible for them and leaves us in charge. Nutro knows how difficult it can be to choose a good, reliable, pet food mix. That’s why they made the Nutro Wholesome Essentials. This pack has all of the necessary nutrients, vitamins and minerals that your pup needs to remain healthy, active and happy. They have been on the market since 90 years, and with such a reputation it’s easy to put all of our trust in their products. Many other customers have already done so, and from what we can see, their dogs have been thriving. Nutro’s packaging looks like something right out of a 1920s commercials. It’s stylish, simple, and straight-forward. 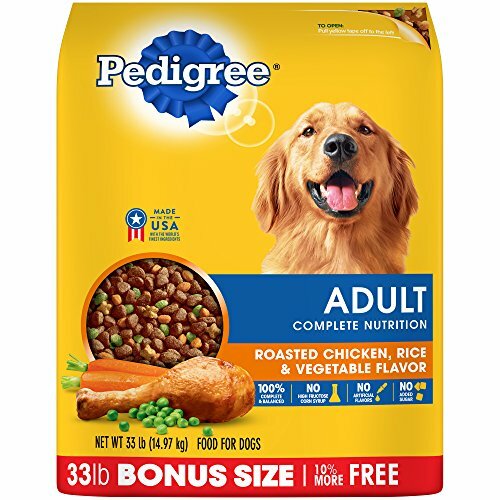 You can also choose between regular kibbles and small bite kibble sizes when purchasing the pack, which comes in 3 sizes: 5lbs, 15lbs and 30lbs. Small bite dog foods are great for Shih Tzu’s, Pugs and other small breeds. 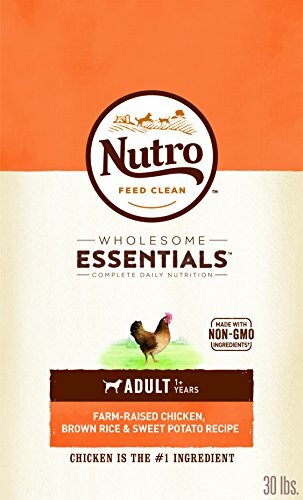 The Nutro pack has a chicken flavor that is 100% natural and made from real chicken parts, no by-product meals included. This ensures that your dog not only gets the best nutrients, but will also look forward to each food batch thanks to its superior taste. Nutro’s package is filled with natural ingredients and other nutrients, like real poultry, vitamins and minerals. You can rest assured that by feeding your pup the Nutro Wholesome Essentials, they will get everything that they need to remain healthy. One special ingredient included within the Nutro Essential pack is the sweet potato addition. It definitely adds a richness to the taste, as well as the brown rice. All of the ingredients within Nutro’s pack are picked to be there, which means that everything in the package has a purpose and is 100% trustworthy. Nutro’s food is clean, has no GMO or by-product meals as we mentioned before and doesn’t contain any corn or artificial preservatives. All of their ingredients come from trusted farmers and suppliers right here in the USA. It can be a scary thought to think that we are in charge of our pets’ health and diet. After all, that’s a big responsibility, and all the benefits and/or negative side effects that come from it can be traced right back to us. It can be terrifying to look at all of the endless rows of the best, inexpensive dog food brands and trying to pick one best candidate. 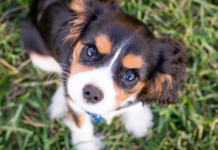 Especially if you are new to owning a pup, you may feel like their future, the dog’s health and well-being are all resting on your shoulders. 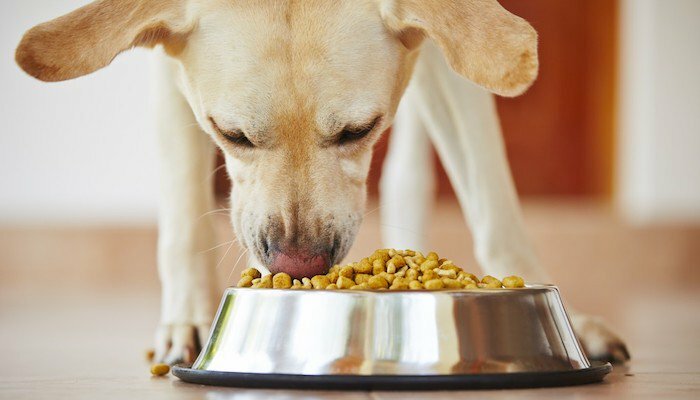 Since we know how stressful this can be, we decided to not only provide you with the top 10 products we think are best for your dog, but also a thorough look into the best cheap dog food in general. What you should look for when buying each package, what matters, and what ingredients are vital for your dog to have each day. We hope that the following paragraphs will help inform you about dog food and its specific benefits, which in turn should make choosing one single dog food brand easier! Packaging can prove to be more important than you think. It’s not only because of the visual appeal that helps attract customers, but because of what’s stated on the front of the pack. Cluttered front cover designs that don’t tell us anything about the nutritious value of the food inside should be avoided. Usually, that means that the cheap dog food brands are deliberately trying to avoid telling us what they put inside.